Ananta Chaturdashi 2018 date, Anant Chaturdashi Vrat 2018, When is Anant Chaturdasi in 2018? Ananta Chaturdashi is observed on the Shudda Chaturdashi during Bhadrapad month. In 2018, Anant Chaturdasi date is on Sunday the 23rd September . Anant Chaturdashi is also obesrved as Ganesh Visarjan in Southern parts of India. Anant Chaturdasi festival is dedicated to Lord Ananta (God Vishnu). 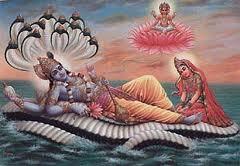 On Anant Chaturdasi day Ananta Vrat is observed. Fourteen tilaks of vermilion are made on a wooden plank. Fourteen puri and fourteen pua are placed on these vermilion strips. A bowl containing Panchamrit is placed on this wooden plank.A thread having fourteen knots, symbolizing Lord Anant is wrapped on a cucumber and is swirled five times. Later this Anant thread is tied on the right arm above the elbow by men. Women wear this on their left arm. This Anant thread is removed after completion of Vrat, i.e after fourteen days.